McSleepy is a device that automatically administers drugs for general anesthesia; it is a closed loop system that monitors for effects and adjusts doses, all automatically. Developed by Canadian researchers at McGill University in Montreal, Quebec and the McGill University Health Centre (MUHC), the McSleepy device is believed to be the first device in the world to be used to perform a surgery. The device is named after the nickname provided to doctors on the TV show "Grey's Anatomy." The device has been used seven times, and has been shown to provide very stable anesthesia to patients. The anesthetic technique was used on a patient who underwent a partial nephrectomy, a procedure that removes a kidney tumor while leaving the non-cancerous part of the kidney intact, over a period of three hours and 30 minutes. To manipulate the various components of general anesthesia, the automated system measures three separate parameters displayed on a new Integrated monitor of anesthesia (IMATM): depth of hypnosis via EEG analysis, pain via a new pain score, called AnalgoscoreTM, and muscle relaxation via phonomyographyTM, all developed by ITAG. 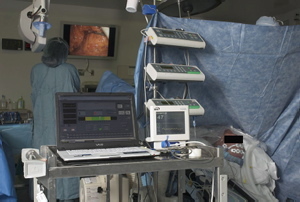 The system then administers the appropriate drugs using conventional infusion pumps, controlled by a laptop computer on which "McSleepy" is installed. I for one welcome our robot anesthetist overl... zzz. Via McSleepy: Automated Anesthesia System.